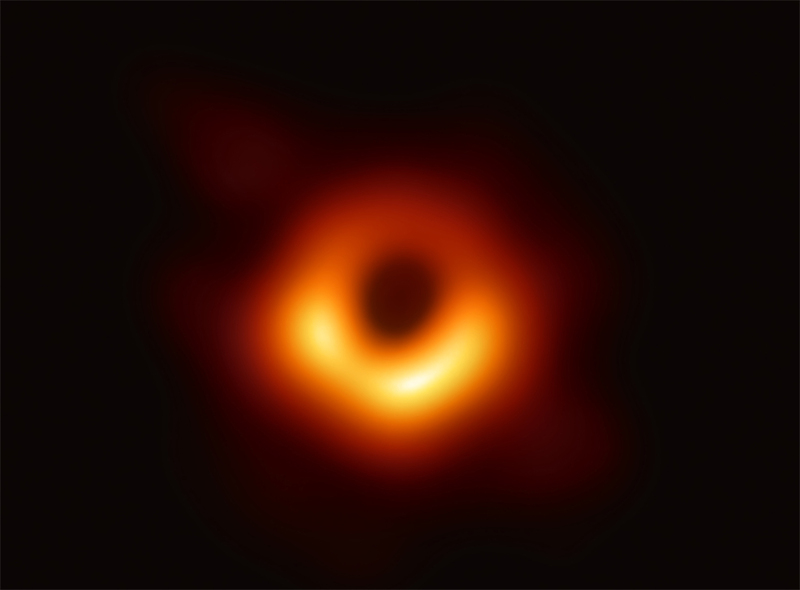 Scientists from the Event Horizon Telescope project have announced the first ever image of a black hole, located 54 million light years away in the centre of the M87 galaxy. The Event Horizon Telescope (EHT) – a global network of eight ground-based radio telescopes – was designed to capture images of a black hole. 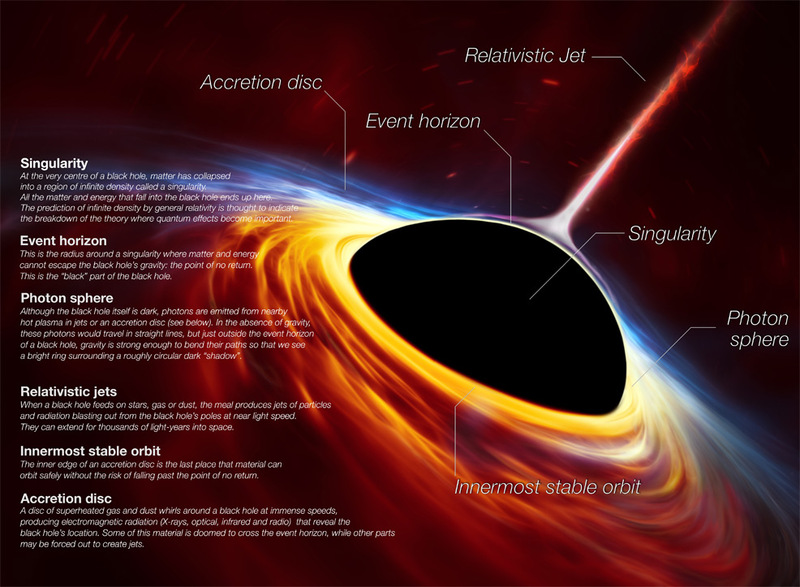 Today in coordinated press conferences around the world, EHT researchers confirmed that they have succeeded in their goal, unveiling the first direct visual evidence of a supermassive black hole and its shadow. This major scientific breakthrough appears in a series of six papers published by The Astrophysical Journal Letters. The image reveals the black hole at the centre of Messier 87 (M87), a gigantic galaxy in the Virgo Cluster, which lies 54 million light years from Earth and is visible to the right of our Local Group in the supercluster map below. The monstrous, swirling object has a mass estimated at 6.5 billion times that of our Sun. The black hole's outer boundary, the event horizon from which the EHT takes its name, measures around 40 billion km across – 900 times larger than the one at the centre of our own Milky Way galaxy, and wide enough to swallow our Solar System beyond the orbit of Pluto. 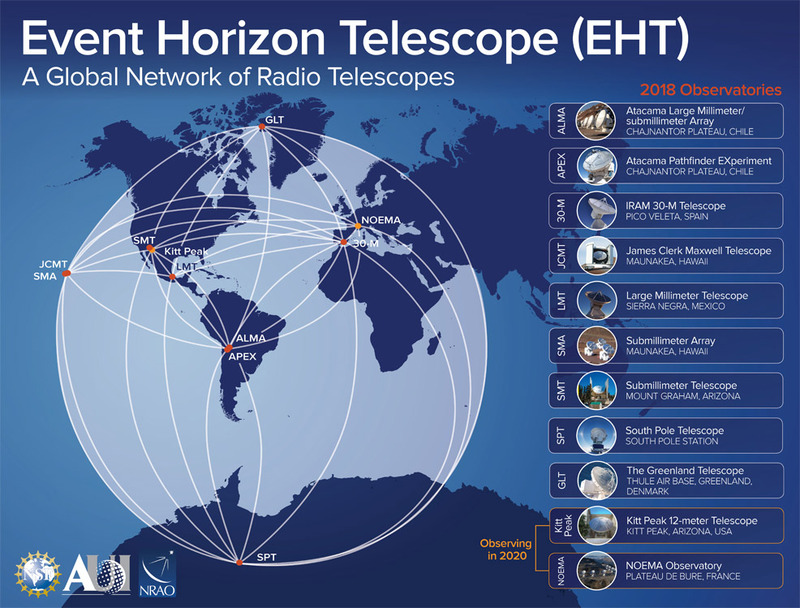 The EHT links telescopes around the globe to form an unprecedented, Earth-sized, virtual telescope. This offers a new way to study the most extreme objects in the Universe predicted by Einstein's general relativity, during the centenary year of the historic experiment that first confirmed the theory. "We have taken the first picture of a black hole," said EHT project director, Sheperd Doeleman of the Harvard-Smithsonian Center for Astrophysics. "This is an extraordinary scientific feat accomplished by a team of more than 200 researchers." Black holes are objects with colossal masses, but extremely compact sizes. They affect the surrounding environment in profound ways, warping spacetime and superheating any nearby material, as depicted in the simulation below. "If immersed in a bright region, like a disc of glowing gas, we expect a black hole to create a dark region similar to a shadow – something predicted by Einstein's general relativity that we've never seen before," explains Heino Falcke of Radboud University, the Netherlands, Chair of the EHT Science Council. "This shadow, caused by the gravitational bending and capture of light by the event horizon, reveals a lot about the nature of these fascinating objects and has allowed us to measure the enormous mass of M87's black hole." Multiple calibration and imaging methods revealed a ring-like structure with a dark central region – the black hole's shadow – that persisted over multiple, independent EHT observations. "Once we were sure we had imaged the shadow, we could compare our observations to extensive computer models that include the physics of warped space, superheated matter and strong magnetic fields. Many of the features of the observed image match our theoretical understanding surprisingly well," said Paul Ho, EHT Board member and Director of the East Asian Observatory. "This makes us confident about the interpretation of our observations, including our estimation of the black hole's mass." "The confrontation of theory with observations is always a dramatic moment for a theorist. It was a relief and a source of pride to realise that the observations matched our predictions so well," elaborated EHT Board member, Luciano Rezzolla, of Goethe Universität in Germany. The EHT observations use a technique called very-long-baseline interferometry (VLBI), which synchronises telescope facilities around the world and exploits the rotation of our planet to form one huge, Earth-size telescope observing at a wavelength of 1.3mm. 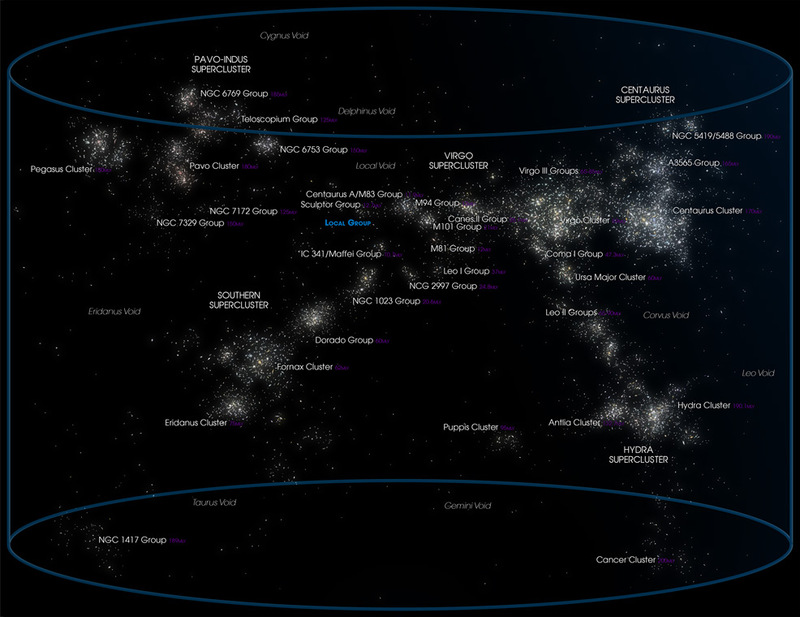 VLBI allows the EHT to achieve an angular resolution of 20 micro-arcseconds – equivalent to reading a newspaper in New York from a sidewalk café in Paris. The construction of the EHT and the observations announced today are the culmination of decades of theoretical, technical and observational work. Each telescope produced enormous amounts of data – roughly 350 terabytes per day – stored on high-performance, helium-filled hard drives. This data was flown to highly specialised supercomputers, known as correlators, at the Max Planck Institute for Radio Astronomy and the MIT Haystack Observatory to be combined. They were then painstakingly converted into an image, using novel computational tools developed by the collaboration. "This is a huge day in astrophysics," said France Córdova, Director of the National Science Foundation (NSF), which provided $28m in funding – the largest commitment of resources for the project. "We're seeing the unseeable. Black holes have sparked imaginations for decades. They have exotic properties and are mysterious to us. Yet with more observations like this one, they are yielding their secrets. This is why NSF exists: we enable scientists and engineers to illuminate the unknown, to reveal the subtle and complex majesty of our universe." "We have achieved something presumed to be impossible just a generation ago," concludes Doeleman. "Breakthroughs in technology, connections between the world's best radio observatories, and innovative algorithms all came together to open an entirely new window on black holes and the event horizon."